Rita Jolivet (born Marguerite Lucile Jolivet; 25 September 1884 – 2 March 1971) was an English actress of French descent in theatre and silent films in the early 20th century. She was known in private life as the Countess Marguerita de Cippico. Jolivet was a passenger on the RMS Lusitania on 7 May 1915, when it was torpedoed by a German U-boat and sank in the Atlantic Ocean off the coast of Ireland. She was saved with others when boats arrived from Ireland. On 14 November 1908 Jolivet married Alfred Charles Stern, but the marriage soon failed. On 27 January 1916 she married her second husband, Italian nobleman Count Giuseppe de Cippico, in Kew Gardens, Surrey. Cippico and Jolivet had no children together, and the marriage ended in divorce. After the divorce, Lady Marguerite Allan (the wife of Sir Hugh Montagu Allan of Ravenscrag, Montreal), another survivor of the Lusitania, introduced Rita to ‘Jimmy’, her husband’s immensely popular Scottish cousin, Bryce Allan of The Cliff, Wemyss Bay, Renfrewshire. He was the son of Captain Bryce Allan of Ballikinrain Castle, Stirlingshire, and his wife, daughter of Stewart Clark (1830–1907) MP, DL, of Dundas Castle, South Queensferry; and grandson of James Allan of Glasgow, older brother of Sir Hugh. Jimmy was a nephew of Sir John Stewart-Clark and Sir Thomas Dixon, 2nd Baronet. Jimmy and Rita’s marriage at the Church of Scotland in Paris on 26 April 1928 was “celebrated with much fanfare”. The reception was held at Ballikinrain Castle (a 4,000-acre estate, which employed fifty servants), and which Jimmy subsequently leased. 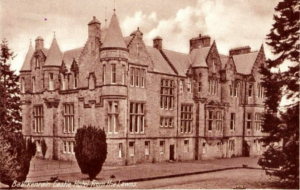 After the war the couple took up travelling again and sold Ballinkinrain, moving to a smaller castle in Scotland, where they threw parties with royalty, heads of state and many other famous people on their lengthy guest lists. Ballikinrain is, in 2017, an independent residential school. It is run by CrossReach, a social care outreach arm of the Church of Scotland.